The 2017 Hyundai Ioniq was just awarded the top honours for the Greenest Car according to the American Council for an Energy-Efficient Economy. The ACEEE awards work to advance environmentally friendly technology, and Hyundai has a lot to be excited about aside from the fact that they beat out the BMW i3 for the top spot. The 2017 Hyundai Ioniq is the first vehicle to offer three electric powertrain options on a single platform. 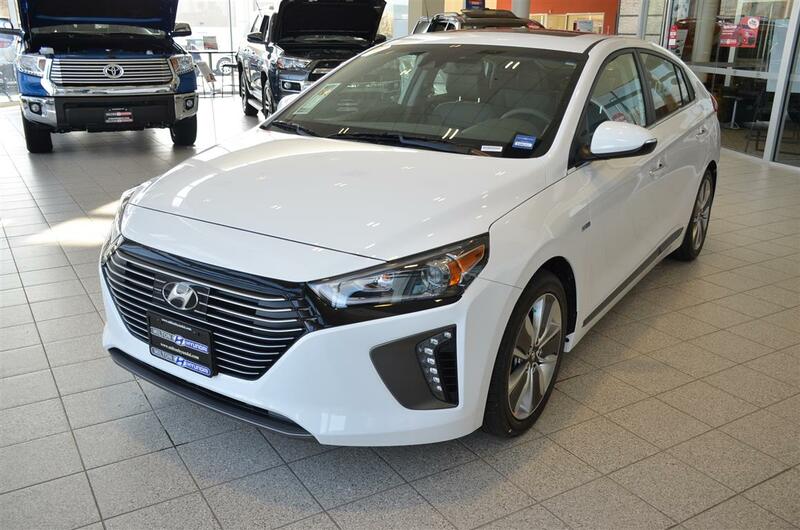 Hybrid, Plug-In Hybrid and Electric motors power the Ioniq to efficiency and cleanliness. The Hybrid and the Plug-In Hybrid both are powered in part by a Kappa 1.6-litre, direct injected 4-cylinder Atkinson cycle engine. It delivers 104 horses and has been specifically designed to be used as a hybrid. Coupled with a 6-speed quick-shift transmission, you get a dynamic driving experience in addition to efficiency. The electric motor in the Ioniq hybrid has 43 horsepower and is powered by a lithium-ion battery with 1.56 kWh capacity. It is located under the back passenger seats for easy access. Combined with the 1.6-litre engine, the system puts out 139 horses and low emissions. The Plug-In model is also combined with the 1.6-litre engine and consists of an 8.9 kWh lithium-ion battery. The Hybrid model lets you travel 1,000 KM on a single tank of fuel. This statistic made the 2017 Ioniq Best in Class at 4.1L/100KM. If you want to go all electric, you’ll find that the 28 kWh lithium-ion battery offers you a range of 200 KM, which makes it great for low mileage drivers who are looking to save money while saving the environment. The Electric has 118 horsepower and is easily charged at home or at work. Hyundai made driving estimates easy for you by adding the driving distance ranges to your display dash. This helps you make advanced plans to recharge when necessary. The optional navigational system can even help you map out the charging stations within your range. Hyundai built the Ioniq using Advanced High Strength Steel to make up their SUPERSTRUCTURE™ lightweight, rigid body. This type of construction offers you a quiet cabin, excellent handling and enhanced safety. Because it is rigid, Hyundai was able to fine-tune the suspension components making it a vehicle with agile response that makes you more confident at higher speeds. The rigid frame also keeps the car quiet, but Hyundai still added extra soundproofing material just to be sure that your ride is quiet. It also keeps the vibration down when travelling at high speeds. Of course, the rigidity gives you a solid cabin for safety, and Hyundai enhanced it further by reinforcing any of the critical areas around the cabin with structural adhesives. This means that crash energy will be directed away from you and your passengers. Since this is an electric car, you get more space inside. The Ioniq offers plenty of cargo room and 60/40 split seats. Plus, there are all the standard features you love like heated seats and available heated steering wheel and rear seats. A futuristic cockpit wraps you up in the latest technology–like wireless charging. Other options include 8.0-inch touch screen, adaptive cruise control and autonomous emergency braking with pedestrian detection. The Ioniq is so environmentally conscious that the Electric model has been painted from soybean oil paints and many of the plastics have been made from a mix of volcanic stone and powdered wood. Some of the soft-touch parts come from sugarcane. We want you to see all of the features of all three 2017 Hyundai Ioniq models, so come by today. You can test drive one for yourself.